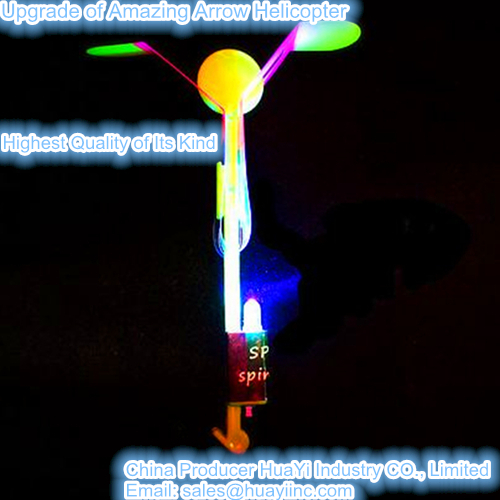 This upgraded Amazing Arrow Helicopter is the end of the poor quality ones. HuaYi do almost everything on this amazing helicopter toy to keep it be ready to shoot for end users, they never complain how to play again! 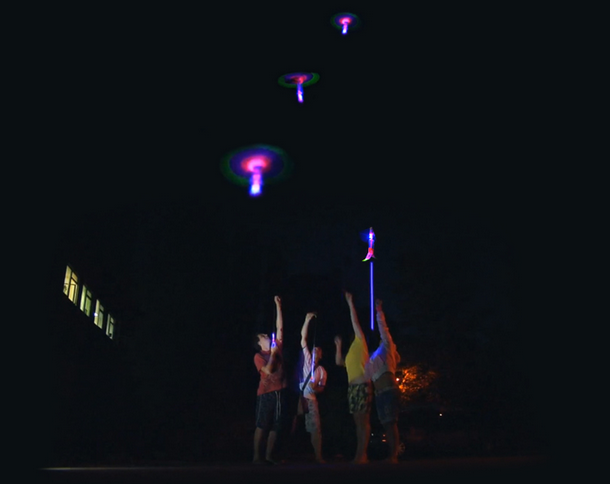 step 1: folding Led amazing arrow helicopter toy into spiral shape, holding the tail of Led space flying saucer with right hand. step 2: stretch rubber band tightly with left hand. (notice: do not point to any people or animal). 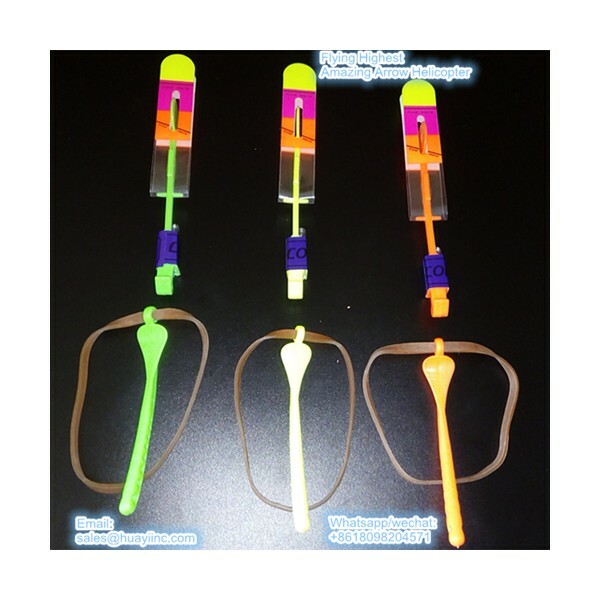 Step 3: let off your right hand, then launching arrow helicopters into air with its rubber band (elastic band), watch it fly into sky lit up by its Led light. 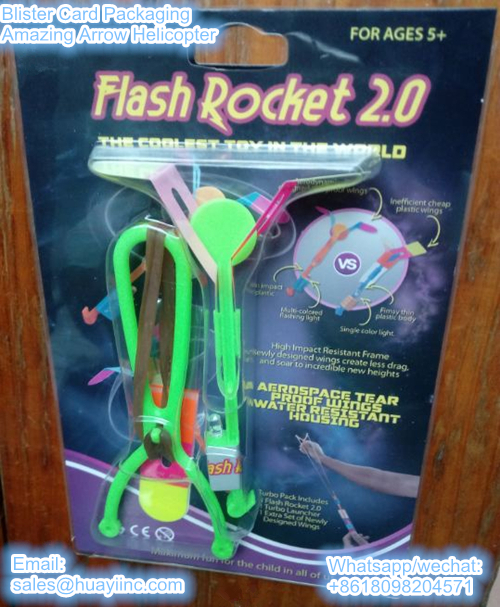 When this flying light up helicopter rocket reaches maximum height with 50-100 meters, its blade open and it drop to the earth again while spinning very fast. suitable for playing in open air with few trees/buildings, like square, lawn, park, playground, commerical street, beach etc. 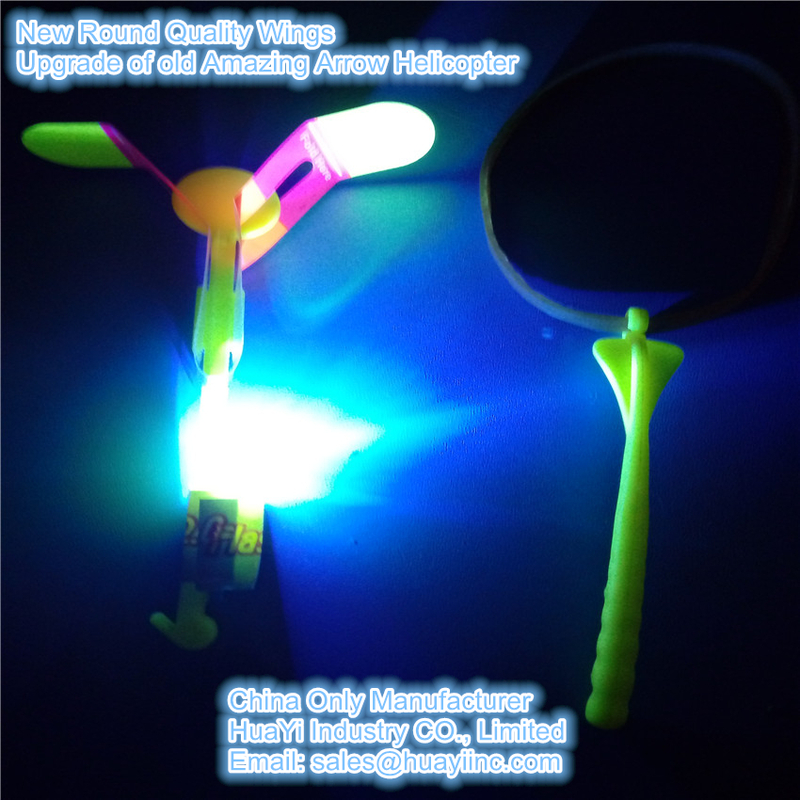 Who can sell amazing arrow helicopter very well? Toy importer, toy distributor, toy wholesaler, toy retailer, or any other ones who love this toy and like to selling them to get profit and make some change to become engaged in funny toys. Especially for ones like part time job selling. This amazing arrow helicopter can be spinning and fall down softly and slowly. It is amazing with the LED light. 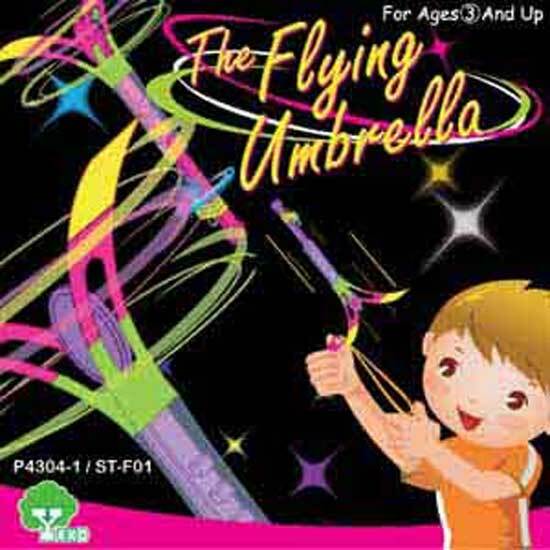 It is just like an flashing mushroom (Led flying umbrella) floating from sky to earth. 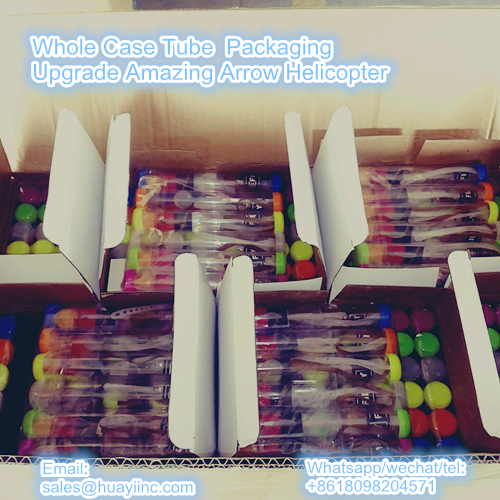 if customer like change the shape of amazing arrow helicopter, we will develop new mold accoridng to customers requirements. 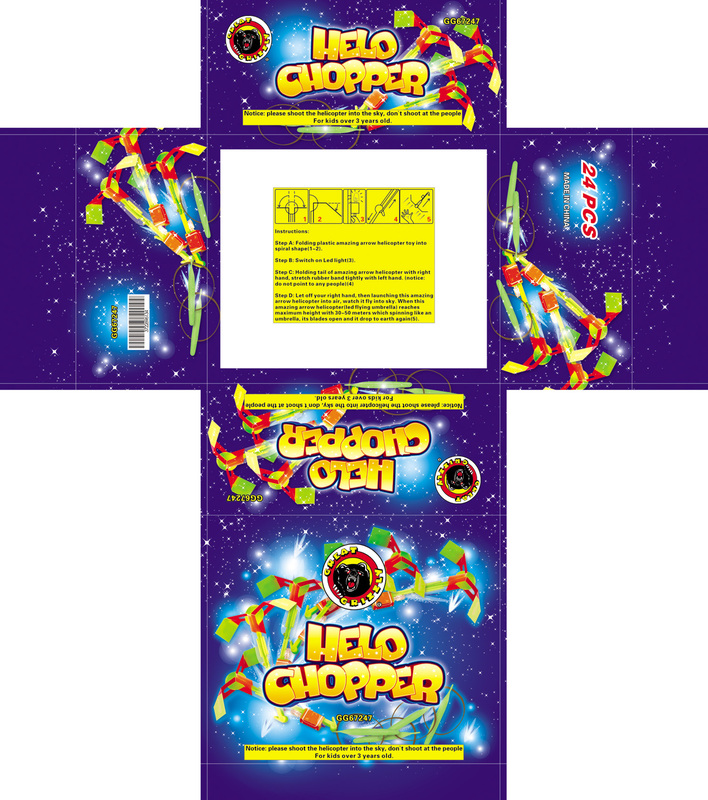 customer send us packaging design, or we can make design for cusotmer, also can pack different quantities (like 2 units, 3 units, 5 units) into 1 pack. Where to print customers' logos to expose personality and promote customers' brand? 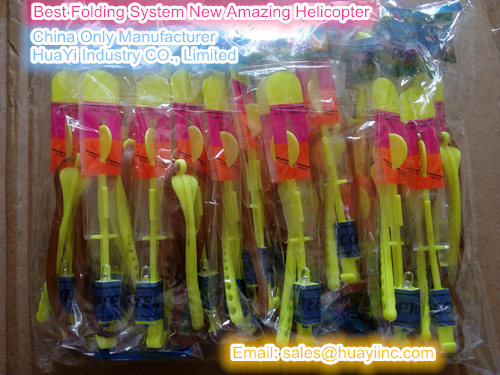 Above image show you right folding and operation instructions on amazing arrow helicopter and some wrong from users. Q: when i travel at HK, Thailand i saw this helicopter toy, and found very interesting, is it made in HK or Thailand? A: no, it is made in China. Q: Amazing arrow helicopter MOQ? Q: Could I get free samples? A: yes, will send you free samples if you pay for shipping cost from China to your country. Q: will I get discount when I order in large quantity? A: yes, different quantity different price, more quantity you order, more cheap price is. Q: Can I get my required colors of amazing helicopter? A: normally try best to meet your color requirement. Q: How long send out my/our goods? A: less than 2cartons, within 1 business day. More than 20cartons, 5-7 business days. 20FT, 40GP, 8-20 business days. Q: Which shipping way you will send out my/our goods? And how long is the transportation time? A: Less than 100kg, send out by DHL/FEDEX/UPS/EMS international expressing service to your door. 2-3 working days. More than 100kg, by air to airport. 3-7 days. More than 2CBM, by sea to sea port. 10-30 days. Q: if I want buy few and need at once, and I hope buy from your USA distributor, is this possible? 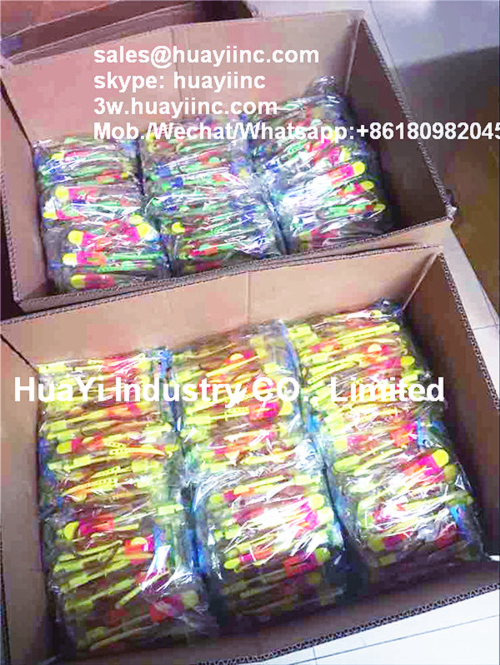 A: sure, we will happy contact our USA distributor to send goods to you directly. 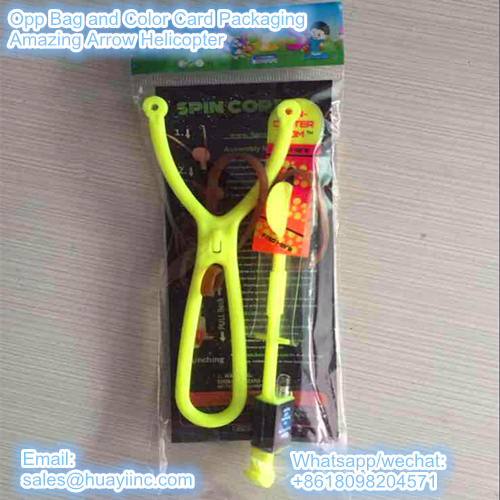 Q: Could you send rubber band helicopters to my/our agent which in Guangzhou, Shenzhen office/warehouse? Q: Could you send arrow helicopters to my/our customers directly and promise you will not contact our customers? 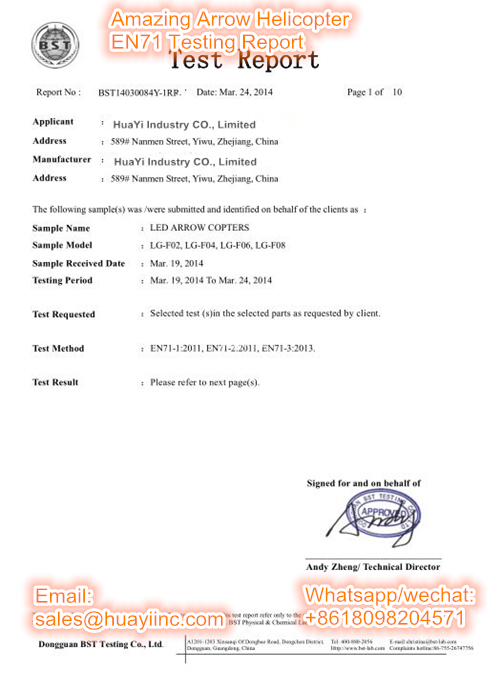 Q: Will you handle import duties for us about amazing arrow helicopter? A: for orders shipped out by DHL/UPS/Fedex/TNT, our price included product cost & shipping cost only, not include import duties. For order shipped by air to airport or by sea to seaport, we could do import customs clearance jobs and pay import duties for customers. A: yes, will help to save import tax for all customers. Q: Can I get extra batteries? Are they free or charged? A: Yes, we sell extra batteries, they are charged. Q: Can I get extra wings? Are they free or charged? A: Yes, we sell extra wings, they are charged. Q: Can I get extra rubber bands? Are they free or charged? A: Yes, we sell extra rubber bands, they are charged. 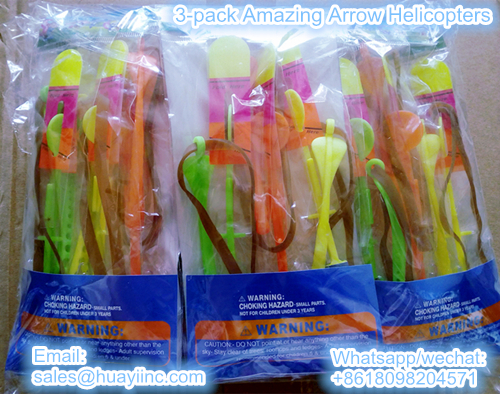 Q: Can you pack 3pcs or 4pcs amazing arrow helicopter into one cellophane bag? A: Yes, we will do this packing way for you. Q: Can you make new battery case stickers with my personal or company logo (information, website, company name, contact phone) printed on? MOQ? 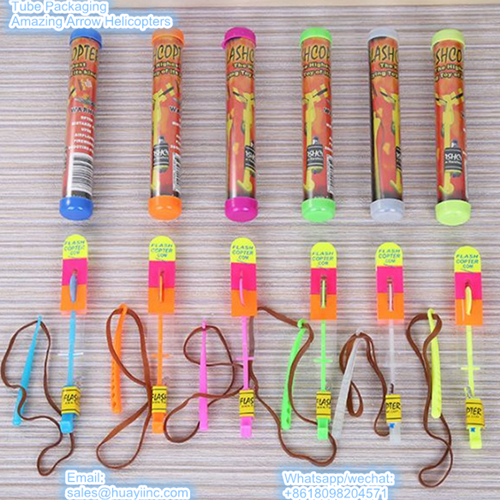 A: Yes, MOQ is only 1 carton of1500pcs for cobra launcher copters and 1carton of 1000pcs for y style launcher copters. Q: Can you print my personal or company logo (information, website, company name, contact phone) on wings, helicopter body, launch handle? MOQ? A: Yes. 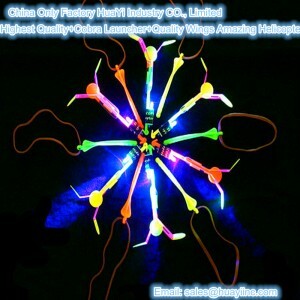 MOQ is 1500pcs, first order should order 20000 wings. Q: Can you do customized packaging with my personal or company information? What is the MOQ? A: Yes, MOQ is 5000pcs. Q: Can you print amazing arrow helicopter instructions paper, folding them for me? What is the MOQ? A: Yes, MOQ is 1500pcs. Q: Private label and bar code on poly bag, ok? What is the MOQ? Q: Can you change helicopter wings color & shape? What is MOQ? 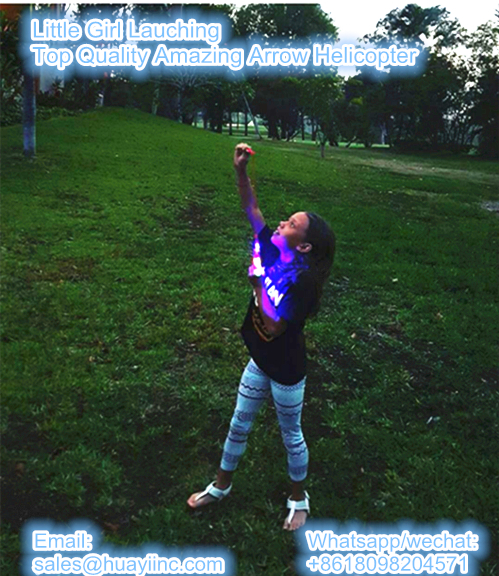 Q: I want amazing arrow helicopter in my own design, could you do? MOQ? 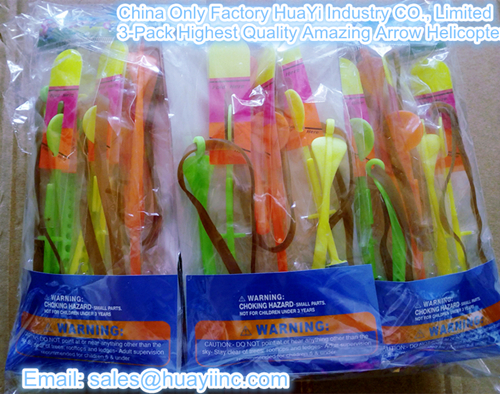 A: yes, we will open new mold for your new design, MOQ is 50000pcs. 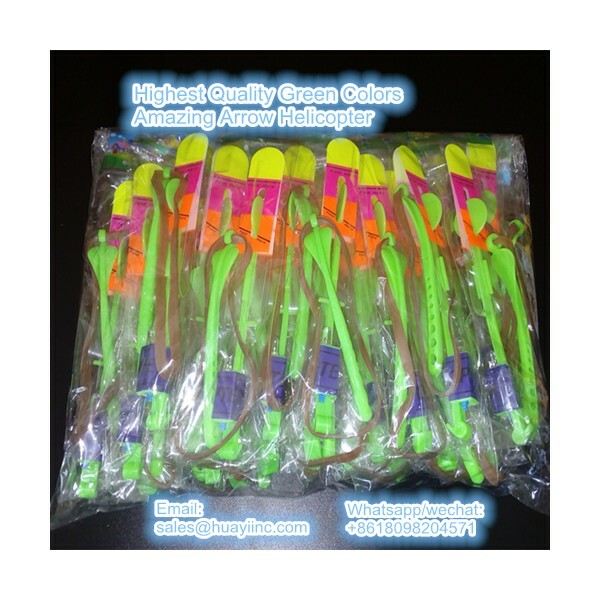 Q: I bought lots from other supplier, but most of helicopters damaged, you offer good quality? A: Yes, our helicopters only with highest quality to keep you sell them very well to end users. 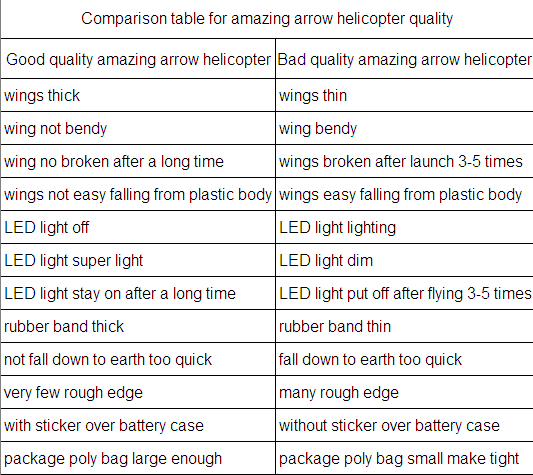 Q: How about your amazing arrow helicopter price? 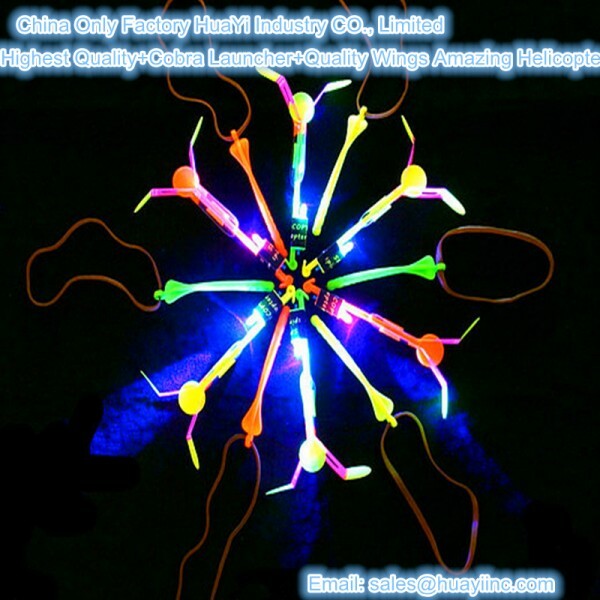 A: We offer cheapest price which based on highest quality. But we would not like compare our price with those bad quality helicopters suppliers. 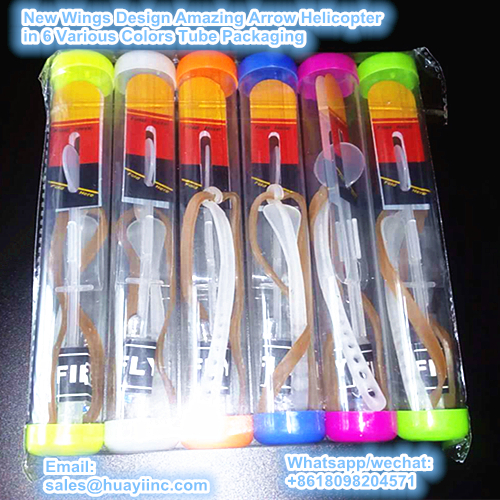 Q: I find other person or company sell your amazing arrow helicopter at our territory, they are my/our competitors, if i/we like become as the only sellers at my/our area, can you give me/us this right? A: Yes, if you with high selling ability, we will sign exclusive distribution agreement with you. In agreement, we will ask you finish certain sales volume at your area for each year and certain order quantity from us at initial stage.